1. Apply oil to a washed and towel dried brinjal. Then roast the whole brinjal over an open slow flame, turning the brinjal to ensure even roasting. The skin of brinjal will char and insides turn soft when cooked. Take off heat onto a plate, allow to cool then peel of skin and chop flesh into pieces. 2. Heat oil, add mustard seeds, allow to splutter, then add cumin seeds ,ginger garlic paste and cashewnuts. Fry. 3. Add green chilli chopped, whole curryleaves, hing, let it fry for a two mins, add tomatoes and tamarind extract, cook till soft and well done. Add roasted brinjal and cook for a few minutes. Check for seasoning. Put entire mix to a blender and grind till smooth. 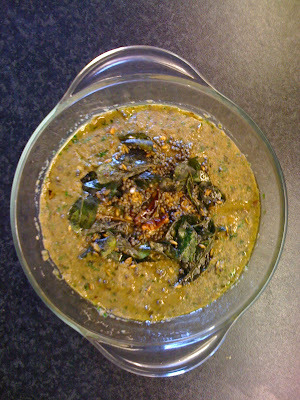 4.For tempering: In hot oil add broken red chillies, curry leaves and urad dal. Pour over chutney. The original recipe has been taken from vahrevah.com and tweeked by me in places for ease of preparation. Thank you vahchef.